Before anything is done about troubled reefs, it should be clear whether the problem you try to solve is solvable at all. Is it possible to farm corals in your reef of choice? If so, CoralGardening can provide you with a unique solution. 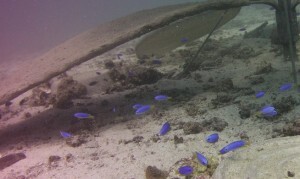 A hard substrate (“bottom”) is often necessary for the succesfull development of a reef. One thing sets CoralGardening apart from almost all the other coral restoration initiatives is our feeling for art. Corals should not be farmed on simple, boring constructions. Corals will grow just as well on beautifull statues and constructions of all shapes and sizes! The artist impression, made by Zes x Zes. Our CoralGardens are designed in such a way that they solve several issues simultaneously. Fish and other essential organisms need to be present for a reef to be ecologically successful. Together with corals and other animals and plants etc. they can form a healthy ecosystem. A CoralGarden will immediately provide surroundings in which biodiversity can increase and (fish) populations can recover. In the long term corals will take over the CoralGarden, bringing a sustainable balance to the system. Already our flowers are visited by small fish! Not only marine life will benefit. Our feeling for artistic designs also improves the underwater experience of visiting divers and snorkelers. Additionally we design special statues that can be used by divers to test and improve their skills, without damaging the natural reefs and sensitive organisms. We design our statues in such a way that it is immediately clear what parts of a CoralGarden should or should not be used for these different purposes. This is what makes a CoralGarden the ideal “alternative” dive site. Education is almost inevitable and can easily be incorporated (prior to a dive of course) by dive masters and dive instructors. Our CoralGarden relieves natural reefs elsewhere. Our CoralGarden statues are handcrafted on land, in cooperation with locals, dive schools and tourists. That way we can both support local economies and bring the importance of healthy reefs to the attention of local communities. If you want to learn more about the building of a statue, check our report on the building of our first statue! We use two different techniques to farm coral. The first, and easiest, is through fragmentation. We search the sea floor for broken off coral fragments that would have no chance of survival if left alone. We plant these onto our statues, and with a little bit of tender, love and care, they continue growing. The second method is about the birds and the bees: coral spawns eggs and sperm every once in a while. Together with local coral experts we collect those cells, bring them together in lab conditions and grow the baby corals until they are big enough to be put in the CoralGardens. 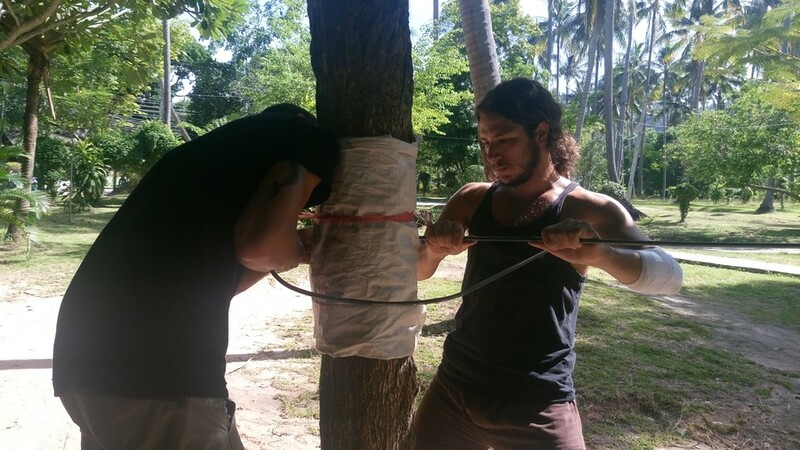 Additionally we use innovative techniques to improve the growth rate of our corals. 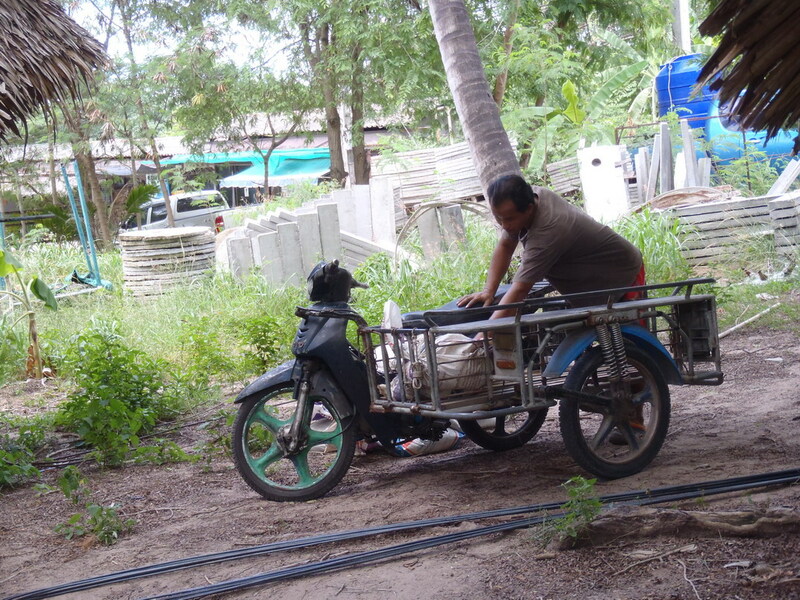 Delivery of material with a saleng. By using only locally purchased materials and services we boost the local and regional economies. Communities will benefit from ecotourism that will visit our CoralGardens and experience what true sustainability is. 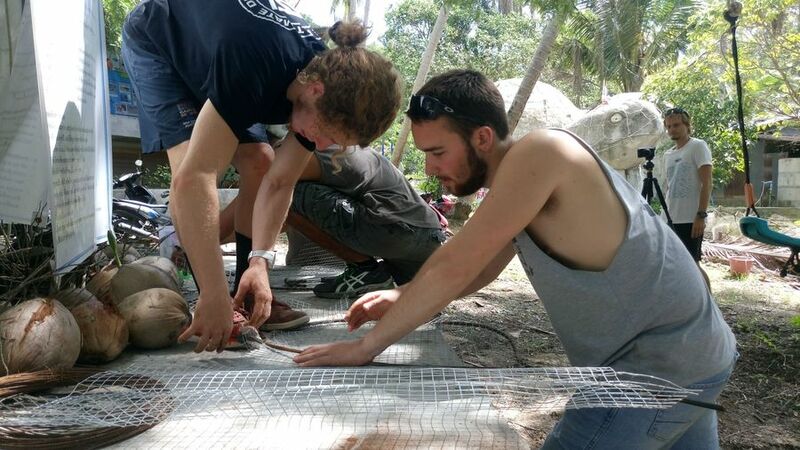 Workshops held in the local communities about artificial reefs and CoralGardens can provide both locals and tourists with more insight and understanding for nature, culture and their interface. 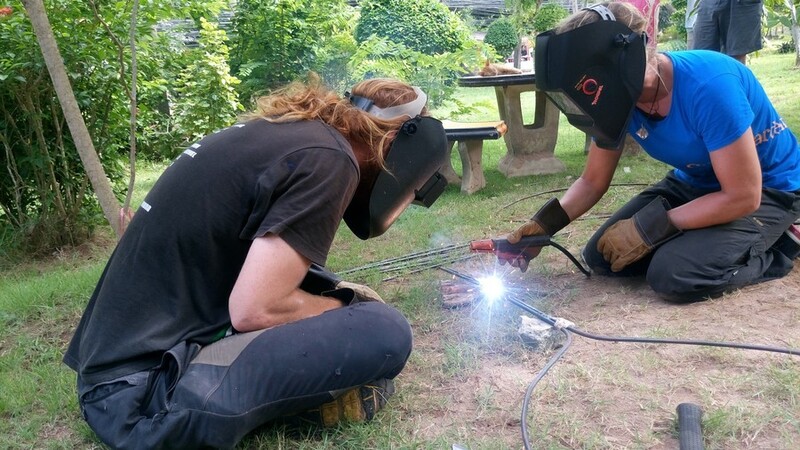 Welding the rebar for a leaf. Constructing chickenwire on a leaf. 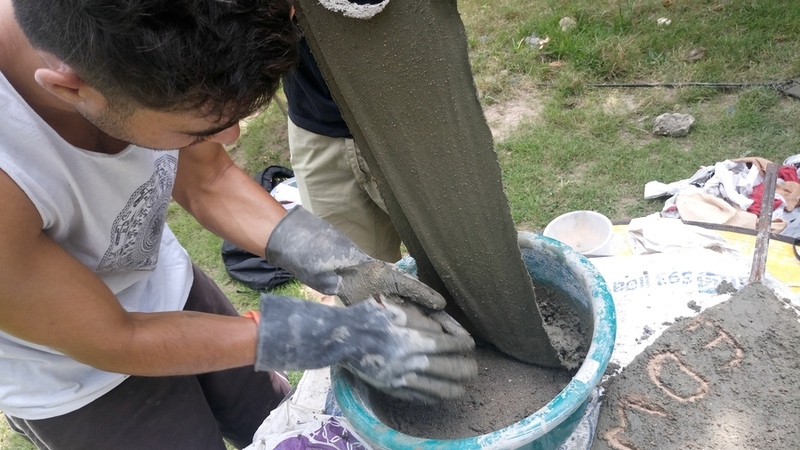 Concrete mache method to cover a leaf. 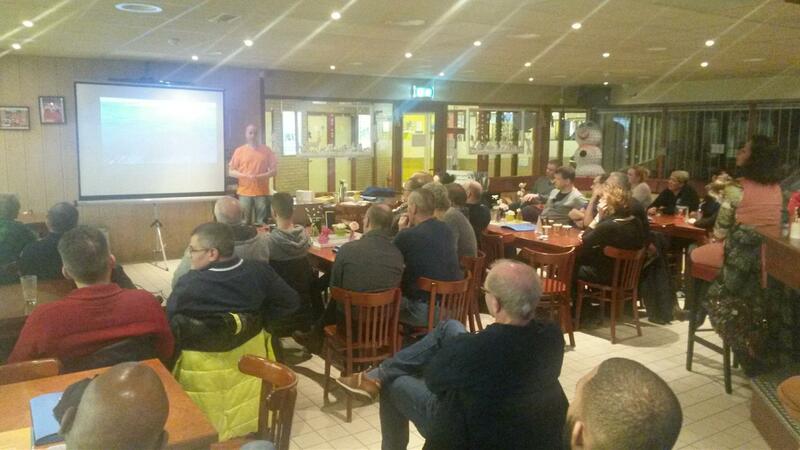 Frank gives a lecture at a diving club. Would you like to make a positive contribution to coral reef restore? That can also be from the Netherlands. 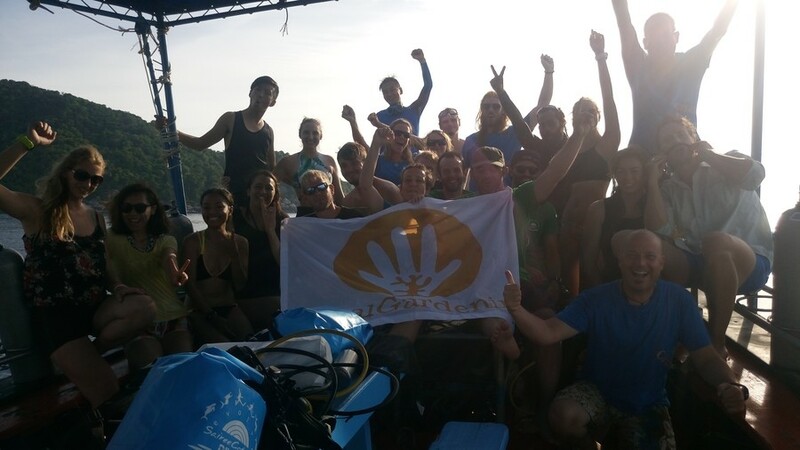 If you have skills or talents that you like to work for CoralGardening, please contact us to see how you can contribute to a beautiful ocean full of life.